In between booking incredible summer and fall vacations for our clients, I made an executive decision to take a much-needed, long weekend break to a hot new property I've been dying to see before it even opened. A huge fan of its sisters at the beach in Laguna and close by in Beverly Hills, I had no doubt that I'd fall in love at first sight with Montage Deer Valley. My hunch was 1000 percent correct, the newest Montage resort did NOT disappoint. 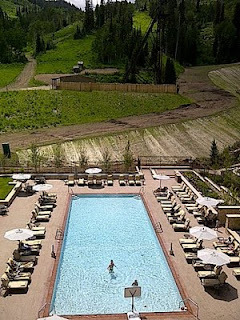 With its wonderful setting just minutes from downtown Park City, Utah and slopeside in Deer Valley amidst a backdrop of seemingly endless mountains, the 154-room resort is ideal for families (there are more activities for kids than I could count). It also works perfectly as a romantic getaway, was the site of a gorgeous wedding while we were there, and can easily accommodate high-end meetings and small groups. Spacious mountain-view rooms and suites, as well as huge residential-style two- to four-bedroom private residences, are beautifully decorated with plush furnishings, fireplaces, oversized tubs, full kitchens, and in most cases, patios and terraces with beautiful mountain views. I only wish I'd added on a few extra days so I could have taken a few more mountain bike rides and hikes, and had a few more hours to relax by one of the hotel's two pools(outdoors when the sun was shining, indoors as the sun went down). The Thai yoga massage I received at Spa Montage from Brandon was one of the best I've had anywhere (including Thailand), and the food at both Apex (dont miss the lake trout) and Daly's was great. With billiard tables, video games and even four bowling lanes, Daly's is the perfect hang out after a long day in the great outdoors (such as the one we had on the Heber River rafting with the very fun team from All Seasons Sports). Come winter, it's easy to picture skiers loving the level of luxury provided, from the custom-equipment fitting done right on-property by the hotel's own highly-trained staff to the infamous boot warmers to the hotel's slopeside location that allows incredibly easy access to Deer Valley's best runs. The close proximity of Montage Deer Valley to Main Street Park City is another key selling point. The hotel has a fleet of Mercedes SUVs with drivers to shuttle guests back and forth, making it extremely easy to enjoy the town at their leisure. I'd definitely return to a few of the restaurants we tried, including Talisker on Main, Zoom, and Cafe Terigo. 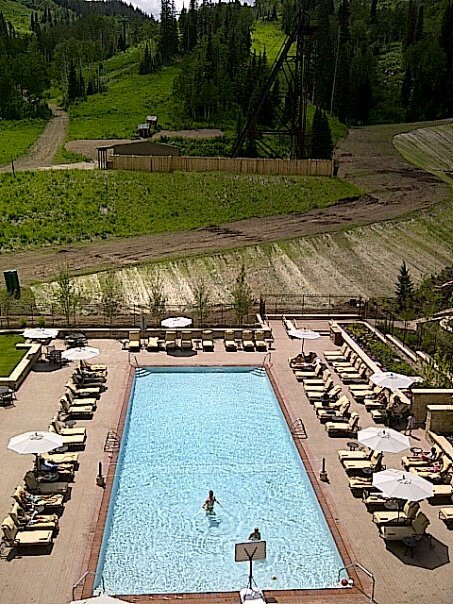 In fact, I WILL revisit these spots when I return to Montage Deer Valley next summer! If you're considering a ski vacation this winter or looking for a last-minute summer or pre-snow fall getaway, definitely consider Montage Deer Valley. It's easy to get to from most spots (you fly into Salt Lake City) and we have amazing Virtuoso rates and added perks to offer (daily breakfast, upgrade priority, late 4pm check-out and special VIP treatment from our on-property friends!). Please contact me to inquire about summer and winter rates at Montage Deer Valley via email stacy@elitetravelinternational.com or phone 310-979-9036. Now this sounds like fun. I have to admit that the river rafting sounds a blast and you certainly found a gem at the Montage Resort. Thank you so much for this article. I've been finding it :) It will helps me much. What a great places!! Hej, jag har bläddrat de flesta av dina inlägg. Det här inlägget är förmodligen där jag fick den mest användbara informationen för min forskning. Tack för inlägget, kanske vi kan se mer om detta. Är du medveten om andra webbplatser om detta ämne. Just looking at the pool, we could know how wonderful the resort is! Wow! !